TH E M R EP O RT | 37 O R I G I NAT I O N S E R V I C I N G A NA LY T I C S S E C O N DA R Y M A R K E T ORIGINATION THE LATEST 'Buyer Remorse' Over Lender Choice Sets in for Some Even satisfied buyers report some regret about lender. W hile overall cus- tomer satisfaction was up when rating mortgage originators, the recently released J.D. Power 2016 U.S. Primary Mortgage Origination Satisfac- tion Study found that a high percentage of homebuyers who had either taken out a new mortgage loan or refinanced in the previous 12 months were feeling remorseful about their choice of a mortgage lender. According to J.D. Power, slight - ly more than one-fifth (21 percent) of those who bought a home said they regretted their lender choice, and that share rose to 27 percent for first-time homebuyers. Among customers who regret - ted their choice, the survey found that in many cases customers had a poor experience—which meant they encountered an above- average amount of problems that may have included promises that went unfulfilled or a lack of com- munication. This group made an average of 9 negative comments, compared to an average of just 0.7 for the entire study. Other situations in which the customer was not happy with the choice of lender were more unex - pected, because overall satisfaction among that group was high. This group typically shopped around, obtaining multiple quotes before making a decision; however, of the respondents who said they re - gretted their lender choice, nearly three-quarters (72 percent) said they were pressured to choose a particular mortgage product, ac- cording to J.D. Power. The survey indicated that financial reasons (such as having a relationship with the firm that gets them a lower rate) were the main motiva- tion for this group in the final choice of lender. 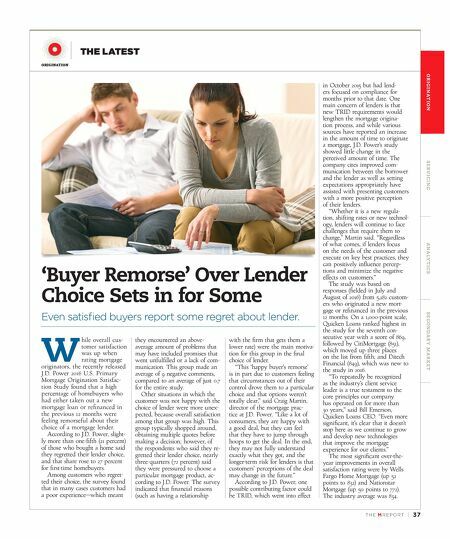 "This 'happy buyer's remorse' is in part due to customers feeling that circumstances out of their control drove them to a particular choice and that options weren't totally clear," said Craig Martin, director of the mortgage prac - tice at J.D. Power. "Like a lot of consumers, they are happy with a good deal, but they can feel that they have to jump through hoops to get the deal. In the end, they may not fully understand exactly what they got, and the longer-term risk for lenders is that customers' perceptions of the deal may change in the future." According to J.D. Power, one possible contributing factor could be TRID, which went into effect in October 2015 but had lend - ers focused on compliance for months prior to that date. 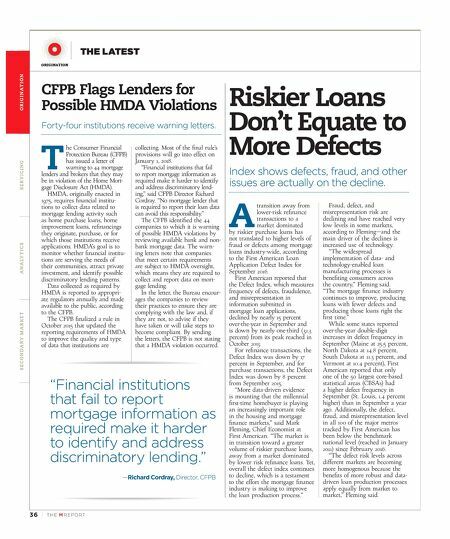 One main concern of lenders is that new TRID requirements would lengthen the mortgage origina- tion process, and while various sources have reported an increase in the amount of time to originate a mortgage, J.D. Power's study showed little change in the perceived amount of time. The company cites improved com- munication between the borrower and the lender as well as setting expectations appropriately have assisted with presenting customers with a more positive perception of their lenders. "Whether it is a new regula- tion, shifting rates or new technol- ogy, lenders will continue to face challenges that require them to change," Martin said. "Regardless of what comes, if lenders focus on the needs of the customer and execute on key best practices, they can positively influence percep- tions and minimize the negative effects on customers." The study was based on responses (fielded in July and August of 2016) from 5,182 custom- ers who originated a new mort- gage or refinanced in the previous 12 months. On a 1,000-point scale, Quicken Loans ranked highest in the study for the seventh con- secutive year with a score of 869, followed by CitiMortgage (851), which moved up three places on the list from fifth; and Ditech Financial (849), which was new to the study in 2016. "To repeatedly be recognized as the industry's client service leader is a true testament to the core principles our company has operated on for more than 30 years," said Bill Emerson, Quicken Loans CEO. "Even more significant, it's clear that it doesn't stop here as we continue to grow and develop new technologies that improve the mortgage experience for our clients." The most significant over-the- year improvements in overall satisfaction rating were by Wells Fargo Home Mortgage (up 52 points to 832) and Nationstar Mortgage (up 50 points to 772). The industry average was 834.